Comments:The Trilogy album is made with the same formula as Collection 1 & 2 , with a special bonus of 3 new songs arranged by Kelly Boy De Lima, featuring the debut of his 3 children, Kapena, Kalena, and Lilo. After 20 years of entertaining world-wide, Kelly Boy has always managed to evolvewith the constant changes his profession requires. 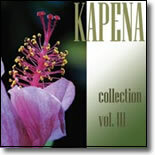 A true credit to the music industry, Kapena continues to be one of the hardest working bands in Hawaii.